Sidewalk chalk is one of those basic necessities for outdoor play….right along with bubbles and jump ropes! We spent the greater part of an afternoon writing and drawing with the chalk and inspired me to write this post! 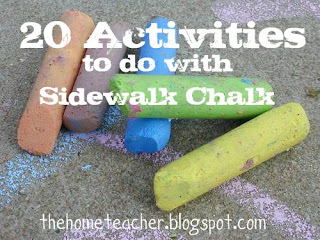 Here it is… 20 activities you can do with your child using sidewalk chalk! Practice writing letters and numbers. If you are teaching your child a letter or number a week, have them practice writing it outside! You can draw the “lined paper”, and write the letter or number using dotted lines for your child to trace. An older chid can practice writing their name and phone number, although you might not want that advertised on your driveway! Practice reading words and sentences. When teaching your little one to read, it is important to provide them with varied literacy experiences. 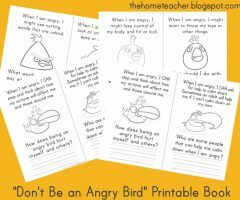 Not only does this provide the practice needed to read, but it makes reading fun. It also shows your kiddo that reading is a skill you use all the time, not just in books. Hopscotch! This classic game can be drawn with sidewalk chalk. Not only is it fun, but it teaches children to count and recognize numbers. 4 square- Another classic game- you can’t go wrong! Shape Hunt- draw various shapes on the driveway. Dance around until you call out a shape (circle, triangle, hexagon, and if you are an artist try the 3 dimensional shapes such as cube, pyramid, etc!) then everyone has to hurry and find one to stand on. Murals- Have fun letting the whole family draw a giant mural on your driveway! We have a little cement retaining wall that would also be the perfect place to showcase art! Body tracing- this could be a lot of fun- just be sure you don’t mind if your kiddo is covered in chalk! The child simply lays down on the cement while another child (or you) trace them! Then have fun coloring in the face, clothes, hair, etc! 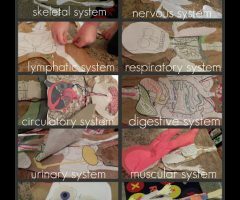 Shadow tracing- great science adaption idea…. go outside during various times of the day and trace your shadow while standing in the same spot (or the shadow of another object such as a can). Each time you trace the shadow, use a different color of sidewalk chalk. Talk with your kiddo about how the sun moves and causes our shadows to move as well! Little Love Notes- write love notes to Daddy to find when he comes home from work! Or choose another family member and while they are away (school, nap, play group, etc) cover the driveway in notes of appreciation, artwork and love! Line Tag- a classic game with a twist- you can draw your lines! And draw them any way you want- squiggly lines, straight lines, dead end lines….. try and make most of them connect though or the game won’t work too well! Sight Word Hunt- cover the driveway in sight words. Have your kiddo run around until you call out a word, and then your child has to find the word and stand on it! Maps- Tie in geography with your sidewalk chalk! Have your child draw a map of their backyard, neighborhood, city, county, state, or country. Make the map as detailed as you can! Little ones can do this too, but they might need some help from you! Car mats- If you don’t mind the little cars getting chalky, have your kids create their own car mat using sidewalk chalk. They can add streets, buildings, parks…. it is totally customizable! And it gets your kids playing outside! Opposite Rectangles- Draw a large rectangle. Divide the rectangle in half. In the first half of the rectangle, draw a happy face. Have your child draw the opposite (sad face) in the second half of the rectangle. 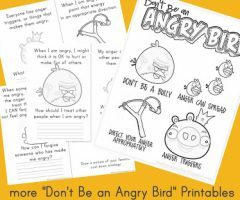 Repeat this activity with more opposites! Analogy Rectangles- Similar to the game above, but divide the rectangle into fourths and use analogies instead. For example, ant:six legs as spider: _____. In the first section of the rectangle you would draw an ant, the second section would be six legs, the third section would be spider, and the fourth is where your child would draw the answer (which is 8 legs). Here is a link to more animal analogies. 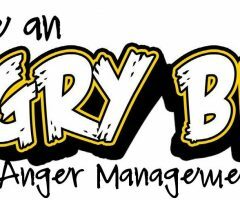 Draw a Nursery Rhyme- A great literacy experience is to have your child draw their favorite nursery rhyme! If your child is older, have them draw their favorite scene in a book they are reading instead. Addition Fun!- Math is a lot more fun when done on the driveway! Let your child try solving math problems outside!! Easy Fractions- Draw several shapes. Have your kiddo draw a line to cut the shapes in half/thirds/fourths/etc. Make sure you talk about fair shares (how each section should be the same size) when they are drawing the lines. Hope this helps as we get our summer fun learning in gear! Happy Teaching! This entry was posted in art & music, learningtime, math on March 28, 2011 by ktoponce. These are all wonderful ideas! Did you come up with all of them yourself? You constantly amaze me! I can’t wait to get outside with our chalk. These are great! My girls love our sidewalk chalk, but these ideas give me hope for involving our little boys, too!